Case Studies | Tri-Mack Custom Aerospace Part Manufacturing Co.
October 9th, 2014 – Victrex has developed a new PAEK-based polymer and an innovative hybrid moulding technology. This allows engineers to overmould a PAEK-based composite with fiber-reinforced VICTREX® PEEK injection moulding materials. The polymeric advancement allows engineers to design stronger, lower cost components that are up to 60% lighter than typical metal and thermoset systems. By working together, Victrex and Tri-Mack Plastics Manufacturing Corporation have engineered an aerospace bracket using this new polymer and technique with the demanding performance requirements of loaded applications in mind. Victrex will be exhibiting its latest aerospace solutions at the Aircraft Interiors Expo on October 14-16, 2014 in Seattle, Washington, at the Fakuma show on October 14-18 in Friedrichshafen, Germany, as well as delivering a paper on hybrid moulding at ITHEC which is held on October 27-28, 2014 in Bremen, Germany. The development of technologies for the Aerospace industry is making significant progress not only from a material perspective, but from a processing standpoint as well. Engineers are requiring lightweight, complex parts at lower costs, higher processing efficiencies, and improved mechanical properties. This can be delivered by using the hybrid moulding process. Victrex, an innovative world leader in PAEK (polyaryletherketone) polymer solutions, has collaborated with Tri-Mack Plastics Manufacturing Corp., a distinguished moulder of high temperature thermoplastic resins and composites for the aerospace sector, to deliver unique structural aircraft solutions. Tri-Mack has a long-standing relationship with Victrex in the development of high-performance aerospace components using PAEK polymers. “Given our expertise in the industry, we were excited to use a new polymer and process to develop an innovative product,” said Tom Kneath, Director of Sales and Marketing for Tri-Mack. Kneath added, “The design flexibility of the materials, along with the technical support from Victrex, enabled us to engineer and manufacture a PAEK bracket that can be produced in minutes compared to the hours it would take for a metal or thermoset equivalent.” This improvement in manufacturing efficiency translates into less processing time, lower energy requirements, and reduced waste for Tri-Mack. Those benefits, paired with eliminating steps such as edge sealing and X-ray inspections, help to reduce overall part costs. The benefits are not only limited to aerospace designs. The overall mechanical properties, weight savings, and processing efficiencies offer a step-change for the Automotive, Energy, and Consumer Electronics industries as well. VICTREX PAEK solutions and information on the hybrid molding process for the Aerospace market can be found at www.victrex.com. To learn more about Tri-Mack’s engineering and manufacturing expertise, please visit www.trimack.com. PARIS, FRANCE – (March 12, 2013) – With the aerospace industry focusing on reducing aircraft weight and lean manufacturing, engineers are searching for reliable solutions such as thermoplastic composites that can perform with at least the same assurance as traditional metals and thermosets. In response to these requirements, Tri-Mack Plastics Manufacturing Corporation, a molder of high temperature engineering thermoplastics located in Bristol, Rhode Island, has developed VICTREX® PEEK composite manufacturing capabilities and produced brackets for use in aircraft structural applications. As VICTREX PEEK polymers have been used in injection molded aerospace components for more than 25 years, Tri-Mack specified the material due to its excellent technical features and proven track record in the industry. Based on current fuel prices and studies, the removal of 1 kilogram (2.2 pounds) of weight from a short-range aircraft can save airlines up to $100 in annual fuel costs. “Assuming that the composite brackets can remove 100 kilograms (220.5 pounds) of weight, an airline with 500 short-range aircraft could save up to $5 million per year in fuel costs by making the switch from metal,” explained Ralf Weidig, Composites Business Leader for Victrex. Victrex will be showcasing the composite brackets at the upcoming JEC Europe show held in Paris, France on March 12-14, 2013. 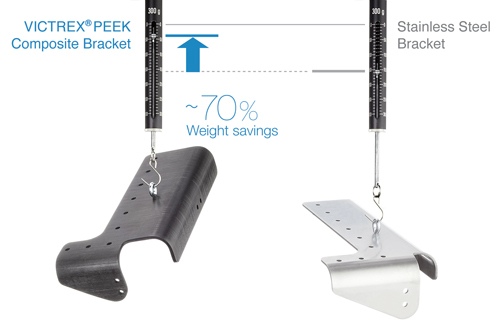 Visit booth J11 to understand the weight savings potential when replacing aluminum, titanium, and stainless steel with VICTREX PEEK composite brackets. To learn more about VICTREX PEEK polymer for composites, please visit us at www.victrex.com.